More specifically, I made a very short review for two TeamViewer versions: for mobile phones with Android or iPhone plus iPad devices, which helps the users are usually always in motion. 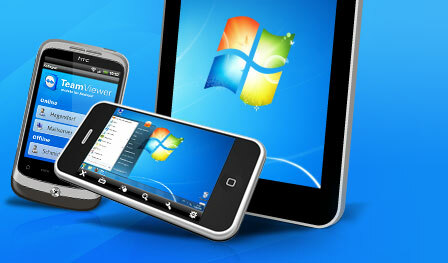 TeamViewer is a program that will allow connection to a PC, regardless of the distance from your location. Everything is done via the Internet, even if the PC route is occurring one or more firewalls throw it can connect to PCs, the only exception being the restrictions on the firewall if it inspects packages that for the source IPs of TeamViewer, filtering field (teamviewer.com), the protocols and ports or a combination of these criteria. With TeamViewer mobile you can offer remote assistance for clients, access your PC at home or office, manage servers, etc, all in order to transfer files, management, troubleshooting, assistance, etc. For personal use it's free, but for other purposes you need to buy a license.